The most recent 3 weeks of sales data were tumultuous, seeing 6 new releases of 3 different movies and some serious chart variance. I’m dumping the data and running through the highlights – there are interesting hints that might help the predictive formula, but all are more suggestive than definite. 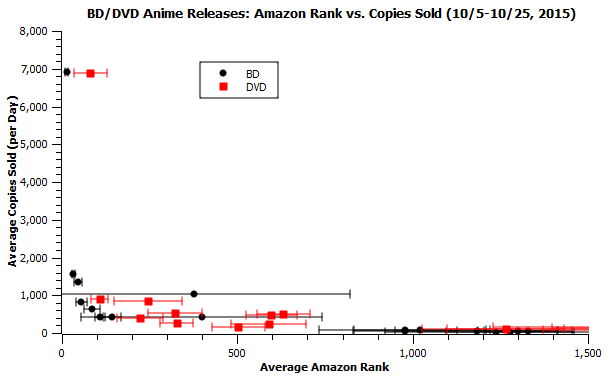 -If you look at the last plot, the one with the top-selling releases minus DBZ, you’ll notice two BD points have abnormally large scatter. Those two are the Ponyo and Arietty BDs on the week of the 25th. Nothing crazy happened, they just went on sale breifly and jumped up to the top of the charts before fading away over the course of a week. Arietty went out of stock after 2 days, and Ponyo remained in stock the whole week, which likely accounts for the difference between the two points (Ponyo sold a lot more) despite the similar ranks. 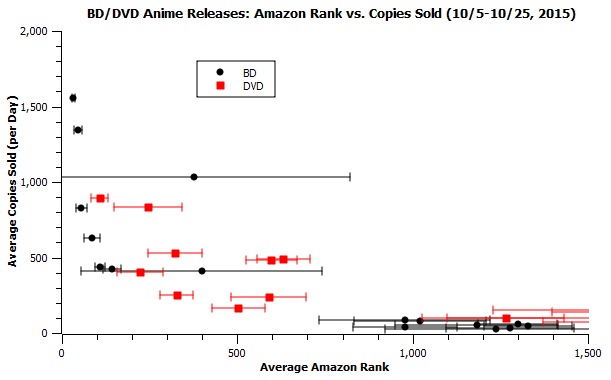 Another thing here is that a jump to the top 50 of amazon is enough to bump these releases’ weekly sales way up above their normal ranges, contributing support to one of the fundamental bases of my little project – amazon moves a fair bit of anime around. -DBZ tracking is a mess because of who knows how Nash counted the RE/LE editions and the addition of a last-minute DVD-only edition. Can’t say too much beyond the fact that it outperformed Battle of Gods slightly. Long-term, we’ll be able to say more and maybe pin down which sales are going into which column, but right now it just makes me all sorts of ambivalent emojis. -During this period we had a couple of releases that ranked in the top 500 or better, so it’s worth looking at whether DVDs are selling more for a given rank over those ranges like they do at weaker ranks. I’d like to be able to say something definitively, but it’s tough to draw a conclusion on that front; DVD and BD data don’t really occupy the same range over the top 500 (the two odd high-scatter BD points discussed above excepted). Some points seem to indicate a really similar correlation, some seem to indicate a factor of two difference in value, and there’s not enough data to just average them out. They still match up well, week 8 a bit less than week 7, as it was a bigger underperformer with a DVD top 30 threshold around 7k. To recap, the average threshold is about 15k give or take 5k. I didn’t carry this analysis through to week 9 and I will probably continue to skip it in the future because it gets increasingly cumbersome to include them each week and I’ve already demonstrated the point I set out to do when I set up this method of analysis – in general, the same numbers mean very approximately the same thing from week to week. Some weeks are less correlated than others, seemingly weeks that “underperform” (observed via the DVD top 30 threshold). The first week of data in this sample serves primarily to flesh out the existing 6-week dataset. The second week provides a bit more insight into the “true” nature of the top 500 slots. You see, all previous knowledge and fitting of the top 500 had come from release week sales data, unlike the curve for higher-up ranks (which came from extended sales data). This matters A LOT because we were not sure how much, if any, preorders tack on to the data in those weeks. It’s tough to be sure becuase both weeks 8 and 9 (our chances to get preorder-free top-rank data for Naruto and Marnie) were both big underperformers. And that should matter even more at the top. Gah. If we take a major leap of logic and assume the two are comparable to week 7, it turns out it’s fairly plausible that preorders were responsible for something on the order of several thousand units sold in the case of the two new releases I tracked over this period (Marnie/Naruto the Last). 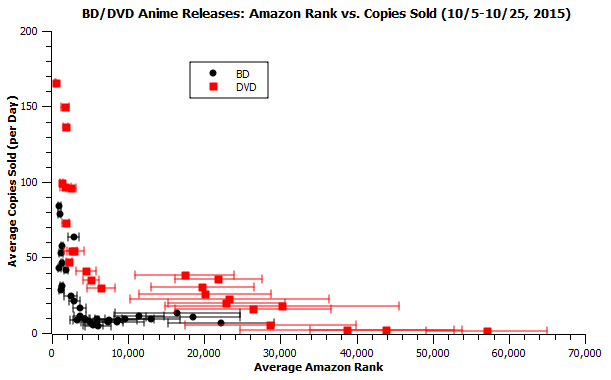 Big thing to point out is Marnie averaged rank #45±10 on its release week, and Naruto averaged #55±15 the weak after. Pretty comparable numbers. But Marnie, getting those numbers on its release week, sold 9398 copies while Naruto sold 5780 on a non-release week. If the weeks were a little more comparable, I would carry this line further, but it’s nothing more than suggestive right now. It’s also worth noting that, when I tried to estimate sales a few weeks ago, my One Piece Film Z w1 figures (wildly under) used preorder-free numbers, whereas Titans and DBZ:Battle of Gods used the potentially preorder-tainted parts of the formula (ranks low enough that I only had release-week data for them) and were reasonably close to the actual values. Again, it’s suggestive. If nothing else, it’s good to add some more releases to the permanent tracking pool. Naruto is particularly welcome, as something neither Ghibli nor Funimation that might help indicate particular quirks those two have. And hey, there’s always more data to come.